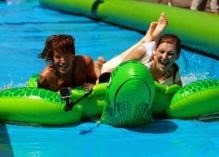 Pgh Momtourage: New Day added: #SlidetheCity! ** UPDATE ** NEW Day being added, Sunday June 7, 2015! Tickets go on sale this Wednesday, May 6. Don't delay -- Saturday is SOLD OUT, Mark your calendar for this Wednesday and get your tickets here! People are always coming up with new & exciting venues for fun, aren't they? 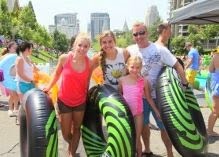 Slide the City is an awesome 1,000 foot slip and slide that will be in Pittsburgh for one day only! I can't wait to check it out. Turning hills into water-sliding thrills is the goal of the event, which was created in an effort to get people outside, having fun, and connecting with their community. Each rider can purchase a one ride pass, three ride pass, or all-day pass. With over 150 events in the US and Canada, and more than 20 international locations beginning with Japan and Australia as early as March, water slide enthusiasts are sure to find a Slide the City event nearby. All are welcome to slide into fun. Visit www.slidethecity.com for more information about Slide the City dates and locations or checkout what fans have to share on Facebook at www.facebook.com/slidethecity. Prices begin at $15, $30, & $50 for early bird. This post sponsored by U.S. Family, all opinions remain my own.